Set at the edge of an archeological district, this resort in New Bagan is surrounded by temple ruins and is close to other famous temples, such as Sein nyet nyi ma and Nagayon. The Kumudara Hotel Pagoda View is set on four acres of pretty gardens and offers chalet-styled rooms and villas. The rooms are decorated with teak carvings and local art work. All have modern bathrooms and private balconies with great views of the surrounding temples and pagodas. 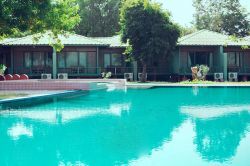 The hotel is about a 15-minute drive from Old Bagan and 12 kilometers from Nyaung Oo Airport. Attentive staff and delicious European, Chinese, and local Myanmar cuisine at the Kumudara Bar and Restaurant help the traveler relax and enjoy the beautiful atmosphere.